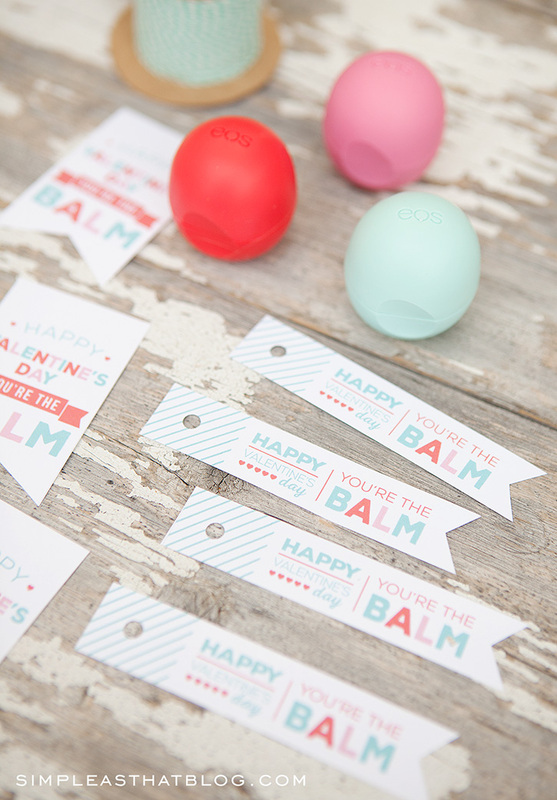 With a short list of supplies and our free printable tags make these simple EOS Lip Balm Valentines gifts for friends, teachers and more on your list this Valentine’s Day! We’ve purchased these EOS lip balms on Amazon when they were on sale, but I’ve seen a great deal on a multi-pack at Costco. The flavors we used are Strawberry Sorbet, Summer Fruit and Sweet Mint. 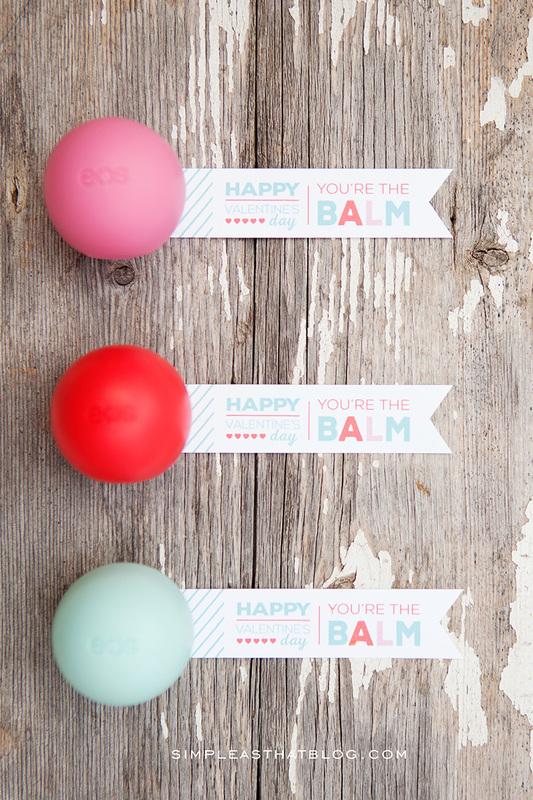 I’m a little bit obsessed with these cute lip balms! These Coconut Milk and Vanilla Mint flavors are my current favs! Turn the EOS lip balm into a cute little candy by cutting out a small piece of cellophane wrap big enough to wrap around the lip balm leaving room enough on each end to twist and wrap. Tie each end with a small piece of bakers twine. 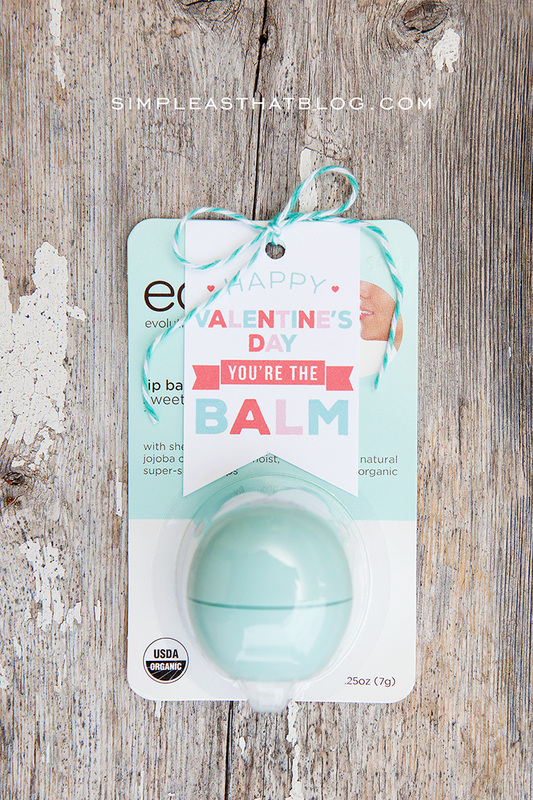 Once you’re wrapped your lip balm, you can attach a fun “You’re the Balm” gift. Add a quick personal note on the back of the tag or simply write who they’re from and you’re done. Make these gifts even easier by simply attaching the gift tags directly to the EOS packages with a little bit of twine. See image below. These gift tags are free for personal use. They are available in two formats for printing. You can download an 8.5×11 inch PDF and print at home on white cardstock OR you can download a 4×6 size print size of each tag and order them at your favorite photo lab. You’ll find the download links to each of the tags directly below. 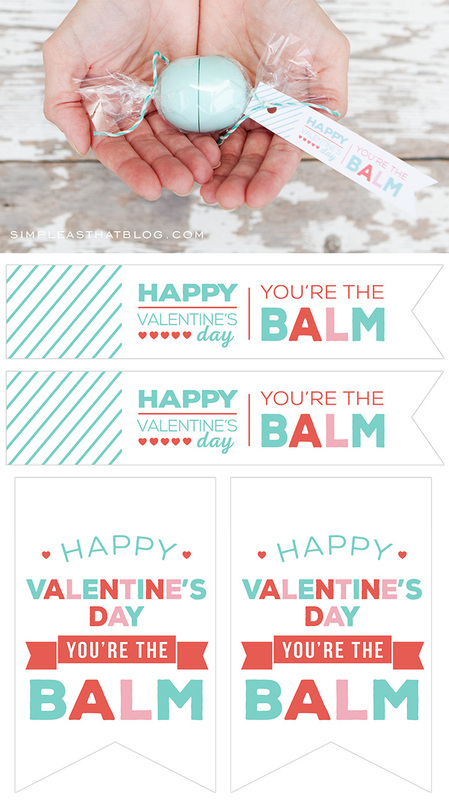 Want to download our FREE You’re the BALM Valentine’s Day Tags? Become an exclusive Simple as That member and get instant access! Click here to join for free. So cute! Just downloaded these, thank you! These printables are so great and have “staying” power. I have used them again this year for male & female teacher aides. Thank you for sharing your creativity! I’m planning to use these for a few Valentine gifts (for my daughter and a few teachers at the school) and I plan to use your Minecraft printable for my son. You share the best ideas! I appreciate your generosity in sharing the printable. Again, thank you. \it is not letting me print. is there a pdf version? The link for the skinny tag is not working…I’m unable to print them. Any suggestions? I had no issues printing. They turned out great for my daughter’s 12th bday party favors. She was born on Valentine’s Day so these are PERFECT!!!! Hi! I had used your template in the past – THANK YOU! This time, I could not remember your site name. Gurl, when I google imaged You’re the Balm an Etsy post popped up. IT IS YOUR DESIGN! they are charging $5.00 !! I suggest that you take a look and talk with this person! SO not cool. Love these!! Found them too late for Valentines – could you please do a Happy Birthday one. I love these and used the Christmas tag for gifts this Christmas. I too would love a birthday tag if you have one, please!!!!! They are such a great inexpensive gift that every girl loves. Thank you soooo much for sharing!!!! These are absolutely adorable! Wish I could do this for mother’s day! Loved this idea!!! So easy to print! Thank you so much!!! Seems like I’m going around in circles clicking links to find the printable link for this but it keeps taking me back to this page asking me to subscribe, which I did. I checked the Mother’s Day EOS printable pdf and was able to access that with no issues. Reading up on comments, seems like people are having the same issue with getting access to the printable pdf. Would you be able to troubleshoot this issue for me? Thank you!